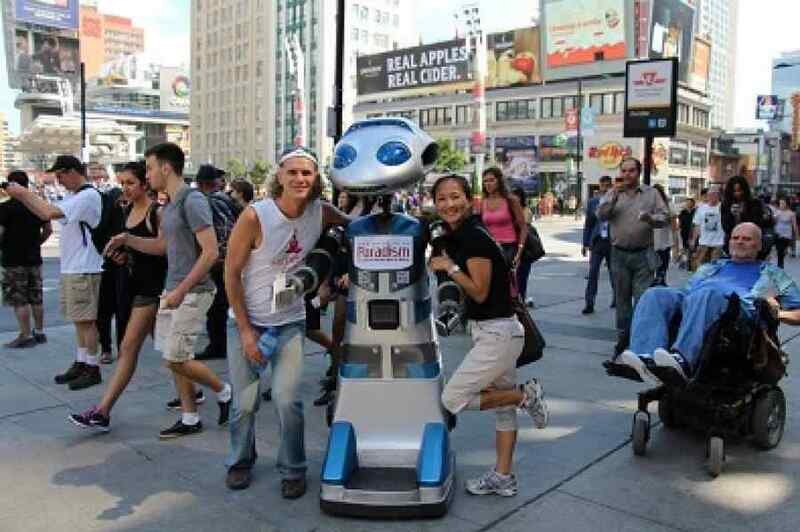 What a frenzy around Sico, this friendly robot that helped spreading a new approach to solve our future ... with an iron fist, in the streets of Toronto, last Wednesday, September 3rd. Nicole Bertrand, Bishop Guide and spokesperson for the event, first offered us, in a press conference, a very convincing summary of what Paradism means and its applications. She stated that Paradism is a new socio-political system that wants, amongst other things, to help replace human workers by robots, a global social phenomenon that will quickly replace competition and greed by cooperation and collaboration. This transformation is not a dream of science fiction, as pointed out by Mrs. Bertrand. We have already developed all the necessary technology and we could get there in just a few years. She added: "If we are treated as dreamers, we dream with open eyes ... this is already happening now." She also quoted Rael, founder of the Paradism, who has stated in the past: "There is no reason to be poor with our current level of technology." Mark Proulx, Raelian Guide and robotics engineer for 25 years, confirmed these statements, indicating that: "The greatest obstacle to the establishment of a world without work through automation, is in people’s minds; individuals, unions and governments." To turn the situation around and overthrow these unfounded fears, the only path is by education and information. Joseph Kollar, also Raelian Priest Guide and robotics technician for over 20 years, stressed the imminent disappearance of factory workers. "These industries are already struggling to find qualified personnel because the young generation understood before us that there is no incentive in working 9 to 5. Our technological progress already allows us to only wish to work in a fulfilling and exciting field." 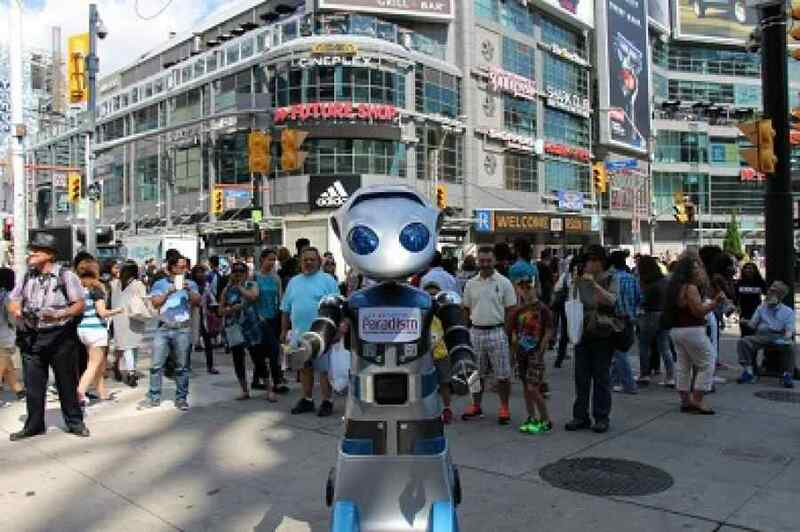 Immediately after the press conference, broadcasted live via the internet, the audience was invited to follow Sico on the streets of Toronto where he would walk past the passers-by of the busiest intersection in Canada on this beautiful warm late summer day. 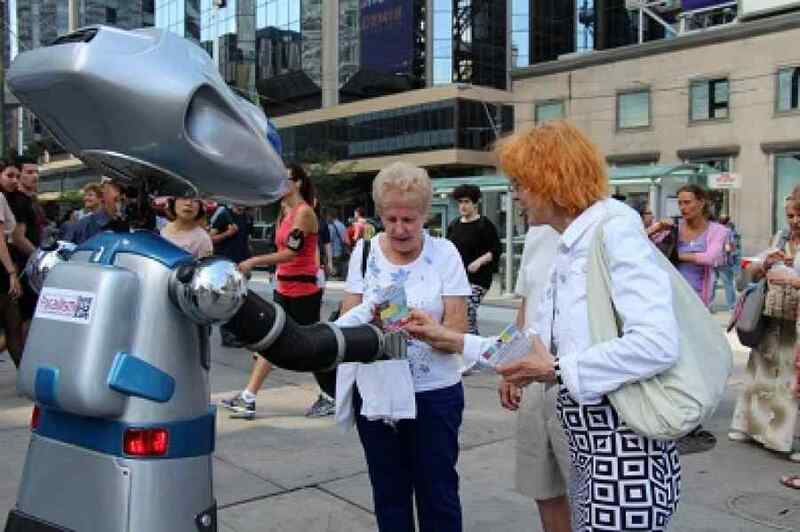 The public's response was stunning, with hundreds of people gathering around the robot that called them out and answered back with a really charming humor. Preston, the technician in charge of the robot, was the first to completely get excited about the event, to the point of forgetting the delayed lunch time. There were several fascinated kids like the one who wanted to offer his car-toy to the robot, just before starting to dance as only children can do. Many people, and even entire groups, attracted by this nice android’s paradist speech, wanted to have their picture taken with him, but the highlight was the people response on Sico’s invitations to dance. A flood of photos and videos were taken with a promise to put them immediately on social media, see here for many more event photos. Faced with such enthusiasm from the public, it is becoming increasingly obvious that the change only depends on the will of governments. We can tomorrow live in this world we dream of. 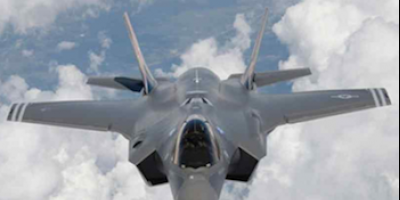 That's why Mrs. Bertrand added: "We ask the government to stop military spending that serve only to destroy and instead finance companies that promote more free time for their employees through research and development. If our leaders do not follow the change, they may simply suffer more, because nothing can stop this transformation already underway." If the Raelians were on the streets with Sico, it was primarily to educate people, because the best thing anyone can do to accelerate the establishment of Paradism is to tell others around us. "People are frightened by this new technology simply because they are afraid of losing the comfort they have gained through their so hard work. 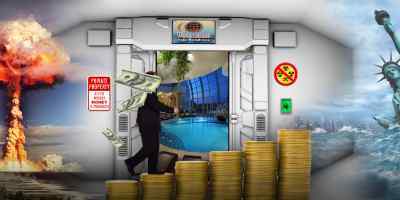 You can talk to them and reassure that everything is in place for a much better life and it is accessible now. There is only one condition to this implementation and that is also what Paradism promotes. The government should move in this direction with the absolute concern for sharing the benefits of this release from working with the entire population", concluded Nicole Bertrand, at the end of this extraordinary adventure spreading the future values of our humanity.